Dave Hickman, whether he knows it or not, has cursed Brian Brohm much more than a losing season ever could. How did Dave do this, you ask? By comparing him to Brady Quinn. Yuck. 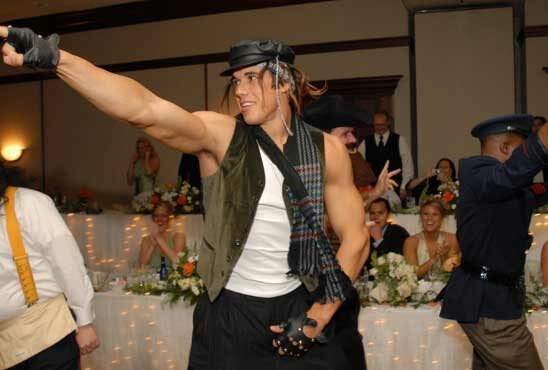 Last January he was Brady Quinn. He goes on to talk about draft stock, but the damage is done. You don’t just come back from being compared to Brady Quinn. Even before Quinn existed, quarterbacks were being compared to him. Andre Ware, David Klingler, Akili Smith, etc. All once and future Brady Quinns. What did you just ask me you sniveling reporter? Of course, Brian Brohm wishes he would’ve gone pro after last season. That is a ridiculous question to ask me, BRIAN BROHM. Brian Brohm passed up being a top 5 draft pick to come back to win the national championship and the Heisman Trophy. Now because of that idiot, The Krag, I, Brian Brohm, does not have a shot at either of these goals. All Brian Brohm got from returning to this trash heap of a University is a wicked nasty case of the crabs. OOOPS, I probably should’ve kept that to myself. What do I, Brian Brohm, think about West Virginia? Brian Brohm, thinks they are a bunch of horse loving idiots, that smell like manurer, and have Napoleon syndrome because they will always be the second best university in the state. Oh no, Brian Brohm has messed up again, those were his thoughts about the Louisville alums. Brian Brohm asks you all to forget about what he just said. This interview stuff is tough, whew. Brian Brohm now wishes to be referred to as B squared. B squared will not respond until you refer to him as B squared. No one, no one, FINE this interview is over. WVU is going to kill us, I just hope I get my stats. Sure this “article” is from last year, but I think it’s worth mentioning. Of course this is just one “boi’s” opinion, but if he says Brian Brohm is dreamy, who is going to argue with him? Not me. The Cardinals’ 6′4″ blonde quarterback is on the Maxwell Award Watch list…or is it Walter Camp…we look into his dreamy eyes and forget. Thank whomever you worship to for giving us at least one reason to watch Big East football! Brohm will have to step up to the plate against Miami and West Virginia this season. Named one of “Out Magazine’s 10 Athletes We Wished Played for Our Team”, Quinn tops just about every Heisman Trophy Watch list. And that’s not the only thing we wished he topped. That alone gets Brady on our list of players to watch this season! Plus being #10 doesn’t hurt either…it’s such a popular number these days. Ohhhh, sexual innuendo. So sassy.